I think we need to change our vocabulary. I remember being on a course focused on finances and we were encouraged not to say “CapEx” and “OpeEx” but instead their full phrases “Capital Expenditure” and “Operating Expenditure” so that we would really focus on what they meant. So while we keep using the phrase “B2C” we are inevitably going to think of it as the same old “Business To Consumer”. How can I, the Business, sell more to my customer, the Consumer? How can I make the consumer like my products? How can I influence the consumer so that they think they need my product? Essentially, how can I push or sell to my consumer? It puts the business first. But these are changing times, we’re moving towards a consumer- or citizen-centric model. We could say “Consumer From Business” and thus put the Consumer first; but I don’t really like it and so I’m not disappointed that it doesn’t abbreviate well. So, let’s move the focus away from “To” and instead think of “Business For Consumer”. That puts the consumer at the heart of what I do because it will make me think how my business caters for that consumer. But that’s not enough really. For a start it’s pre-sale too. Am I getting it right up front so that I have the right products for my customers? If I understand my customers, and most importantly my most profitable customers, I – as a business – should be building my business upon them. I need to take the lifetime value of a customer into account. My products should be built for them, my offers should be hyperpersonalised to them. Not that this is easy. Ever since IT was introduced to everyday business we’ve used it to improve our processes, to make ourselves more efficient. Our focus has been on our own internal optimisation. Now we need to look outward for continued optimisation. We should be aiming to get the right message, at the right time. for our customer, every time. In reality these days even those who are at the forefront of this may just be wrong less often which in itself is no bad thing, but our target must be getting it right, not less wrong! We can use many sources of information, and build analytical models to better understand our customers, getting more and more sophisticated until we have a segment of one. We integrate our Systems of Record (the single source of truth, transaction stores, data warehouses, etc.) and Systems of Engagement (the more modern, social, interactive, customer facing front end systems/apps/etc.) and create Systems of Insight which consist of the aforementioned analytical models. For example, IBM is working on a technology called “System U” which can use fewer tweets than you’d expect (I’m not sure if I’m allowed to share much information about this publicly) – as well as data from other social media sources and enterprise data – to derive a detailed model of an individual’s Big 5 personality traits, values, fundamental needs and social genome (i.e., who they are close to and in what context). This allows extreme personalisation of offers, at the right time. I definitely recommend watching the YouTube video but it’ll take an hour of your time. Of course, if you are a company who has not been capturing email addresses for your customers until recently you may not have the most accurate view of a customer’s preferred channel for communication. So within a System of Insight a feedback loop is necessary to take what has been successful, what has not, and improve the accuracy of the results of our analytical models. Which is all very nice in theory. And although I said that the experience of interaction wasn’t enough it is still extremely important. 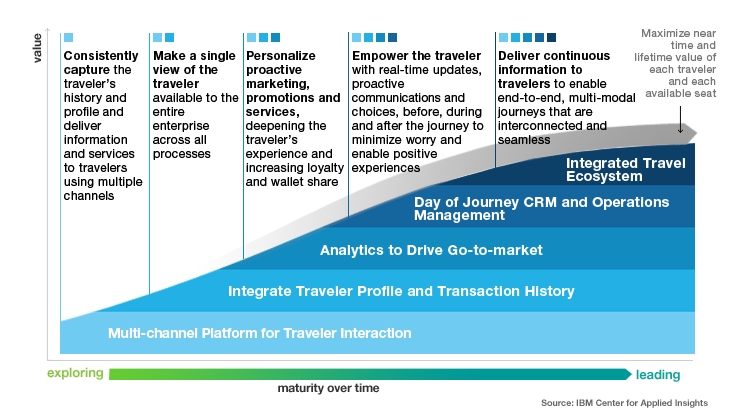 In the interest of practicality I think this chart(1) from www.ibm.com is a really useful one to demonstrate how a transportation organisation can move to being customer centric. But back to my original point: B4C. As consumers our access to mobile technologies is redefining our sense of immediacy, intimacy and efficiency. We have different expectations of the businesses from which we purchase products; we see ourselves and our opinions as more important and with social technologies allowing us to share our points of view with many, many people whether in formal business or product reviews or just a negative tweet. And so those businesses have to readjust their thinking and put us first. They exist because of us and it’s easier now than ever to make that known.